The target audience for Looking for Lansbury may be one that is already quite well-versed in the life of its subject. 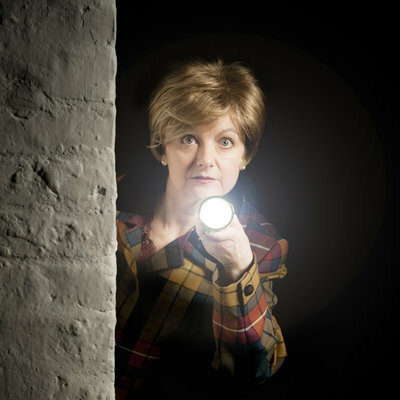 However if Fiona-Jane Weston’s one-woman show exploring the life of Angela Lansbury provides little in the way of revelation (even to a novice Lansburyian), it does a creditable job in avoiding falling into sugary hagiography. Weston pitches her all-singing, some-dancing, variety show part way between biographical lecture and conversational cabaret. It starts off with a strong statement of intent as Weston sets out her case but as Lansbury’s career as a leading light of the stage begins to take off it increasingly resembles a procession of Broadway belters interspersed with conversational snippets. The opening provides a backstory that takes in Angela’s grandfather, George Lansbury (former Labour Party leader) and his role as a social reformer. We get a potted history of her English upbringing before being whisked across the Atlantic, and into her remarkable early successes in film – two Oscar nominations in her first two roles (Gaslight and The Picture of Dorian Gray) – before charting her life on stage and screen. A slight problem is that Lansbury is an intensely private individual; there is little in the public domain to draw on and much content is given by way of inference or supposition. The snippets we do get, such as a Hollywood magazine article on her first husband Richard Cromwell, are uncomfortably salacious for a show that seems to wish to avoid the tittle-tattle of unauthorized biography.